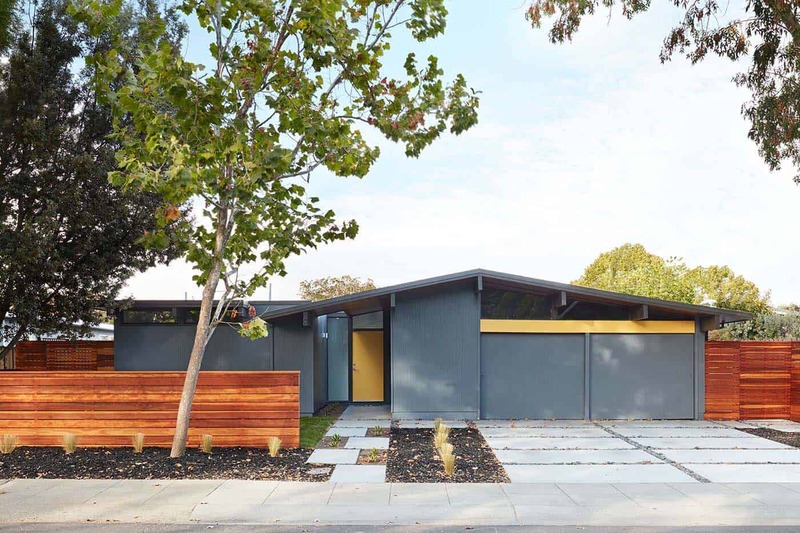 Klopf Architecture was responsible for the renovation of this four bedroom, two bathroom Eichler house located in Palo Alto, a city in the San Francisco Bay Area, California. 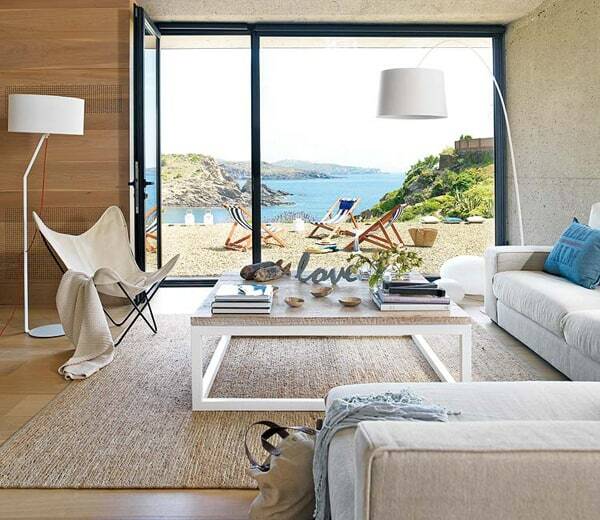 The new layout features open spaces that are bright and airy and more functional for family living. 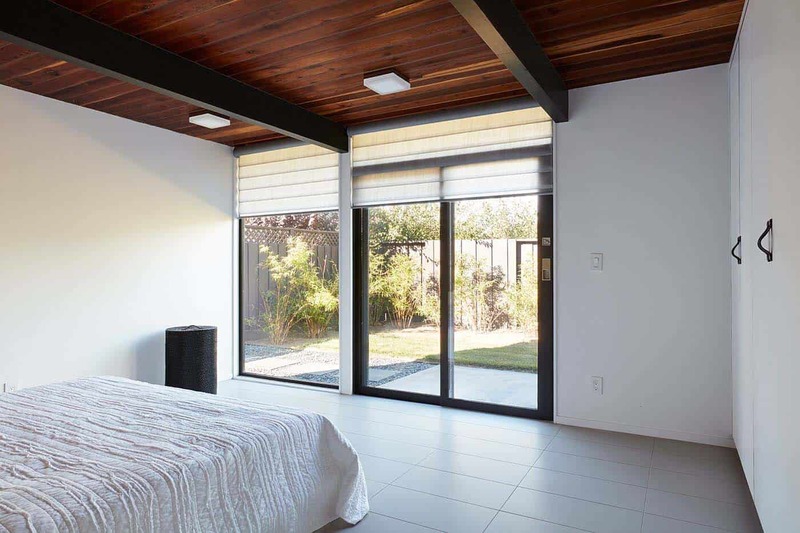 A reconfigured great room features floor-to ceiling windows and sliding glass doors, seamlessly connecting the indoors with the newly landscaped patio and seating areas outdoors. 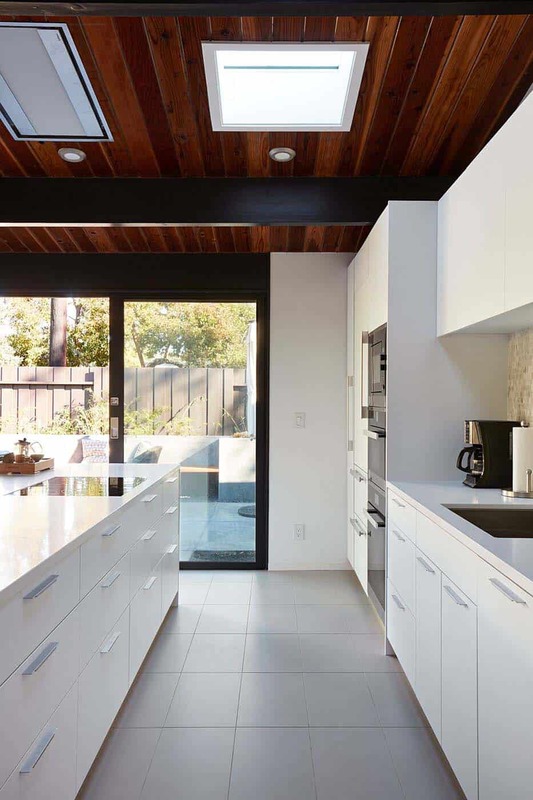 A galley kitchen was relocated and opened up to create clear sight lines through to the great room and beyond to the patios and yard. 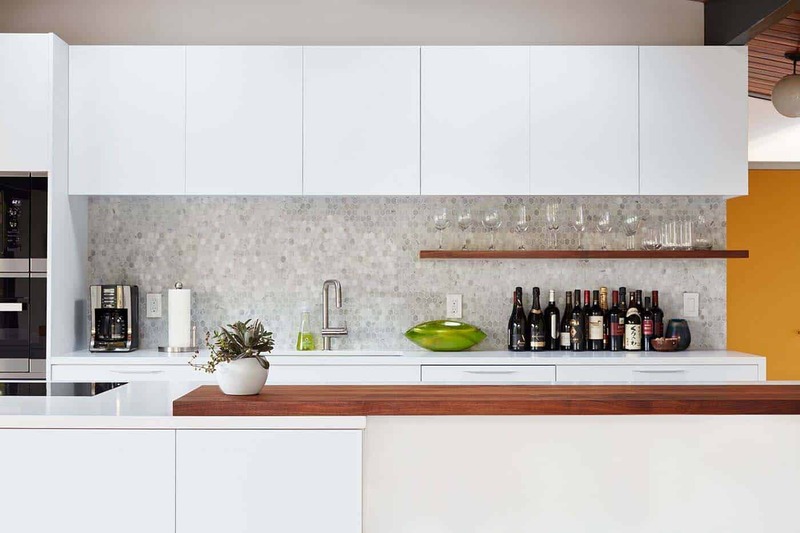 The new kitchen features a large center island and stunning walnut bar countertop with seating. 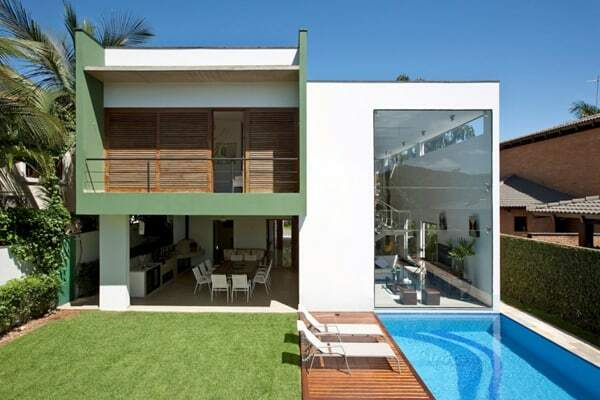 A small addition to the front of the home allowed for a more expansive master bathroom and hall bathroom layout. 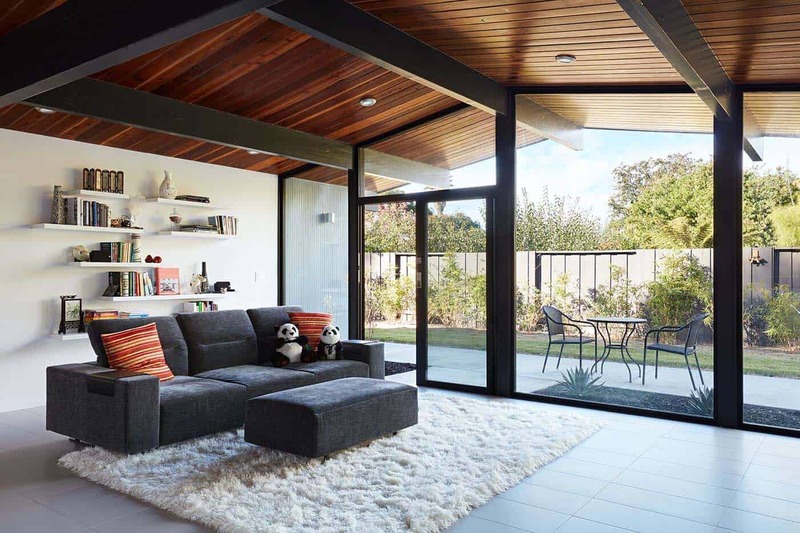 An old brick fireplace was removed and in its place, expansive sliding glass doors and several skylights helps to illuminate the home with natural light. 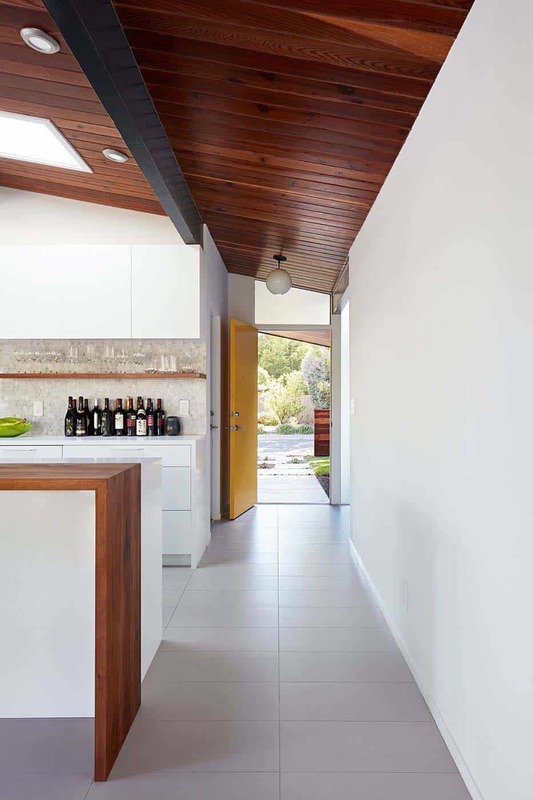 The goal of this project was to work within the Eichler style, this entailed creating a more open layout with and indoor-outdoor connection and functional design. Additionally, the building envelope was developed to be more energy-efficient, with a well-insulated roof. 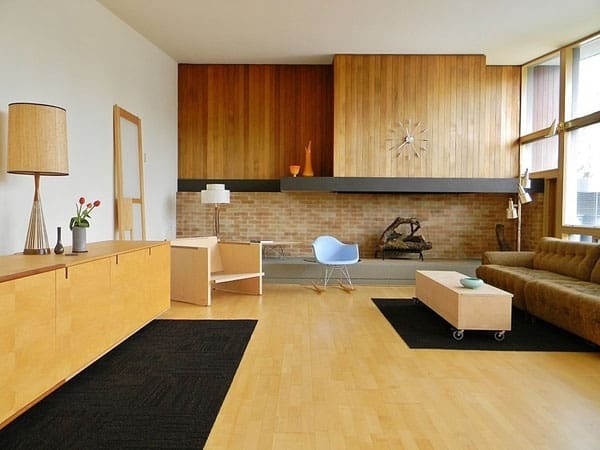 These were the details that any Eichler homeowners would appreciate. Durable grey porcelain floor tiles throughout the interiors helps to visually unify the home, creating a continuous flow. 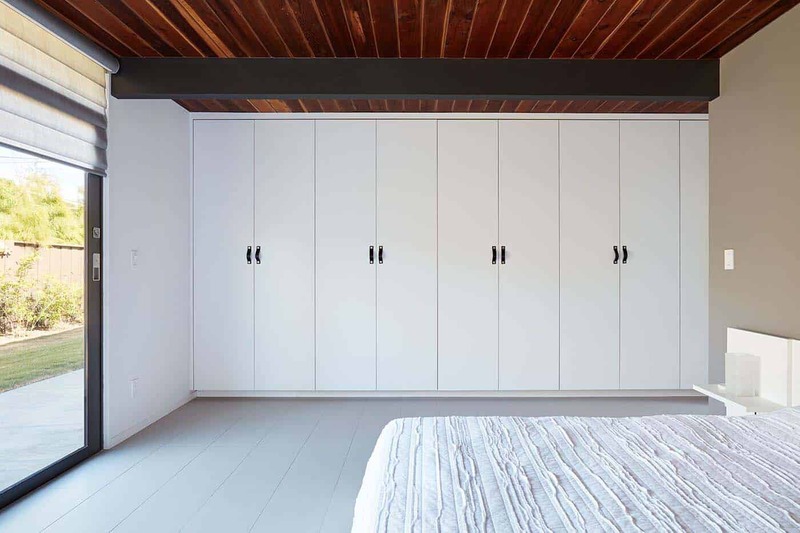 The flooring, along with the white walls, serves as the perfect backdrop for the unique elements and materials to be showcased. 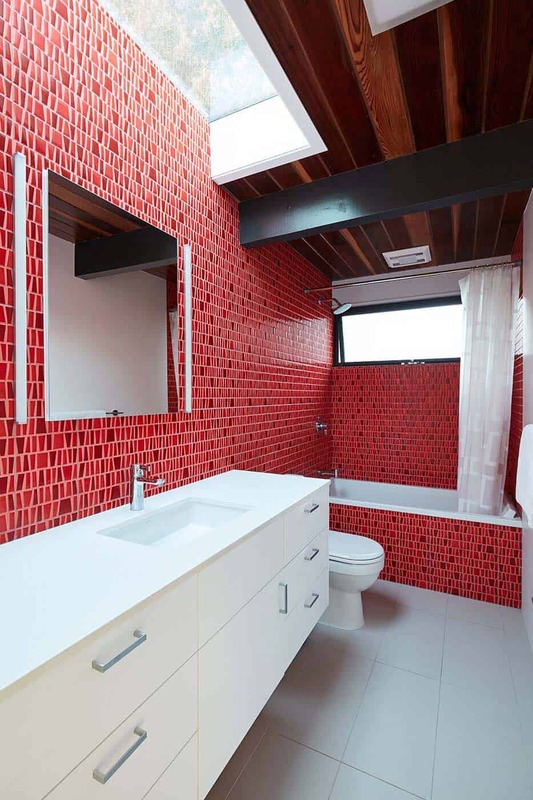 This includes the brightly hued mosaic tiles in the master bathroom and the walnut bar and furnishings, along with the stained ceiling boards. 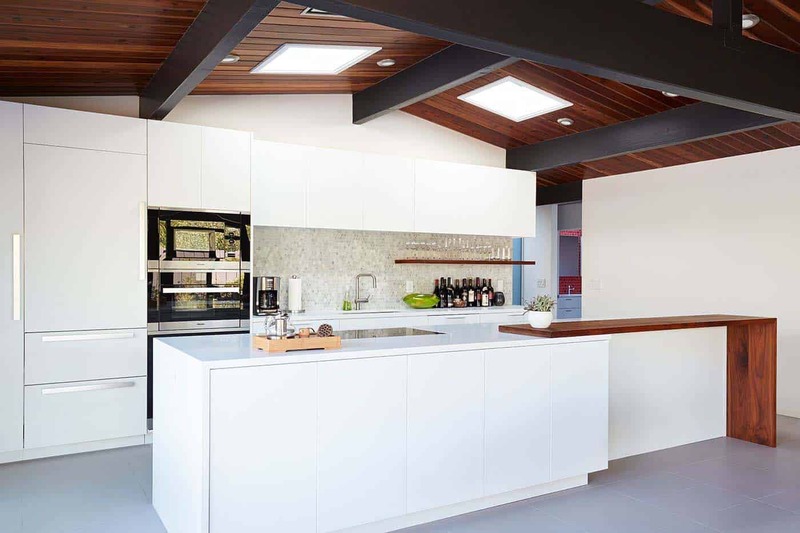 What We Love: This Eichler house remodel offers a bright and airy new layout that is stylish and functional. Meeting the needs of family living, spaces flow effortlessly from one to the next, while the lines of indoor and outdoor living are blurred. 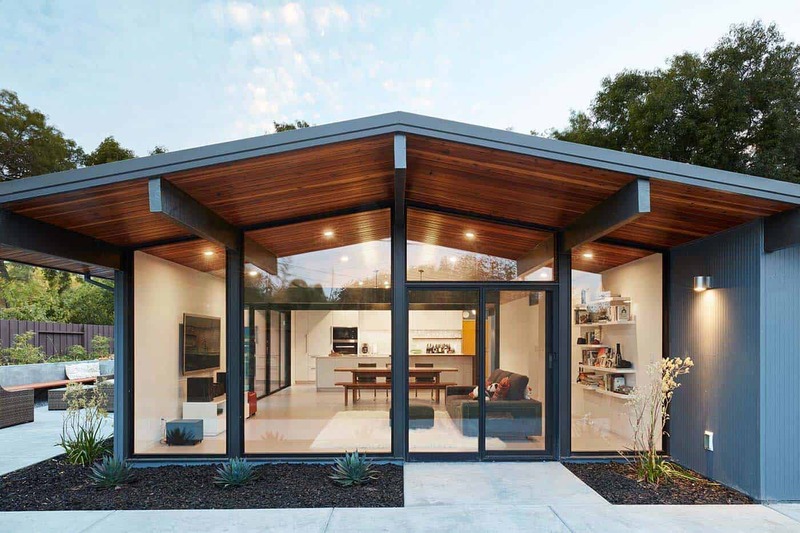 The Eichler character has been well-preserved in this home, the architects have done a fabulous job of creating clean lines and livable spaces — both indoors and out… Readers, what do you think of this remodel? Are there any details you would have liked to have seen done differently? Please tell us in the Comments below! 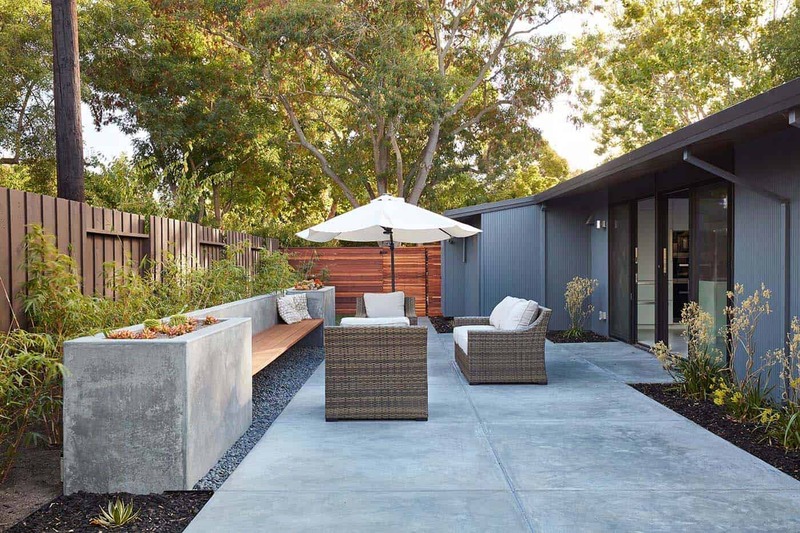 Note: Have a look at a couple of other fabulous home tours that we have featured here on One Kindesign from the portfolio of Klopf Architecture: Indoor/outdoor connectivity defining mid-century modern Los Altos home and Fascinating Eichler atrium home remodel in the heart of Silicon Valley. 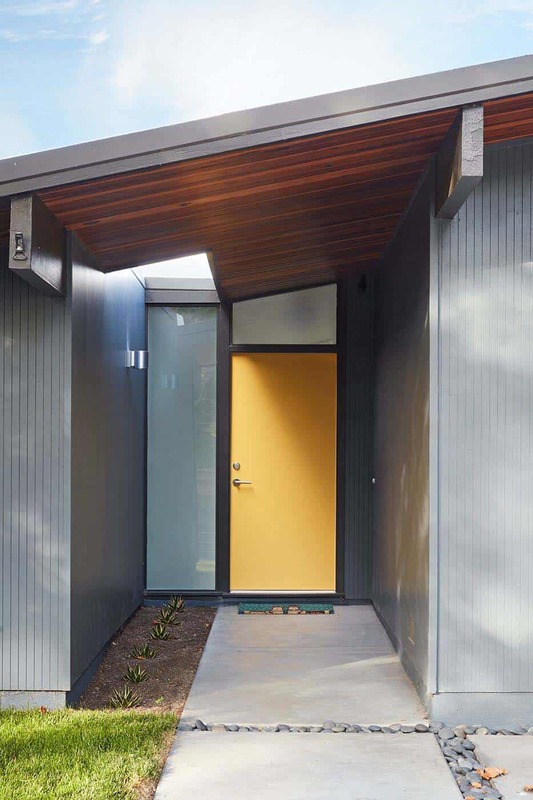 Above: Unique details were lacking in the original entry, so the homeowners requested to have a more gracious front approach. 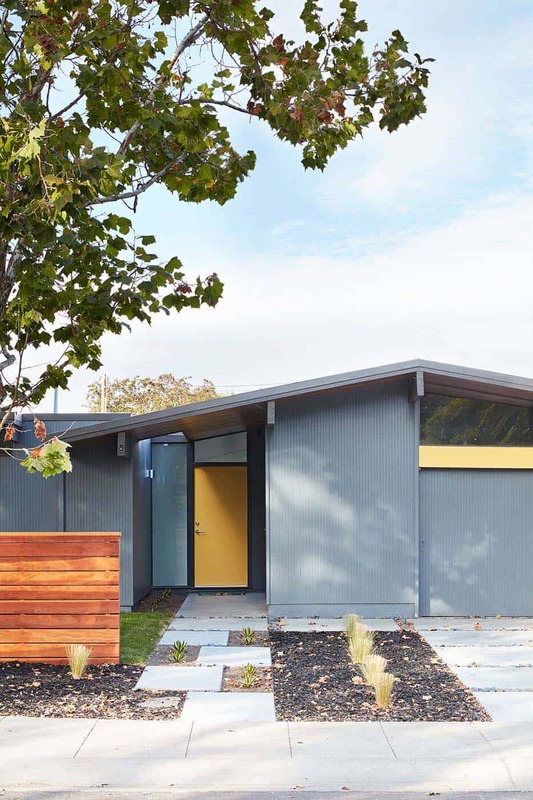 An historic Eichler color palette was applied to the front facade to give it a fresh, modern update. 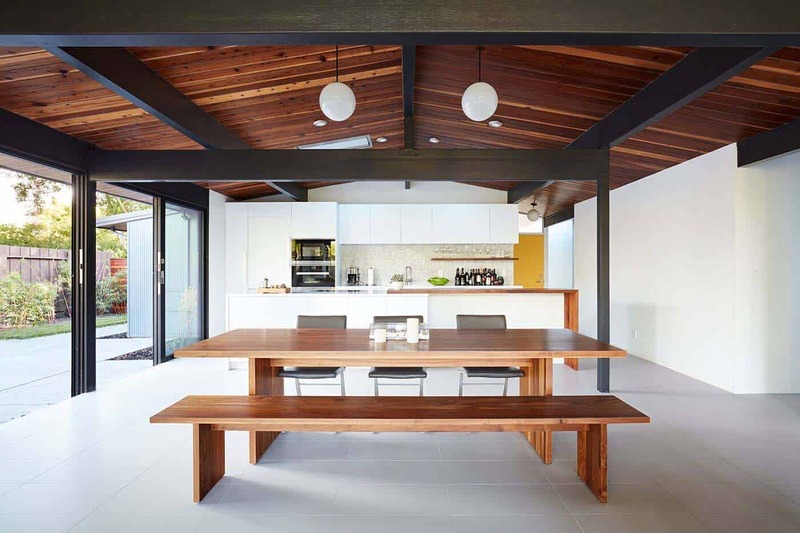 Above: A secondary living space was extended out to the patio, where a bench and additional seating was added.